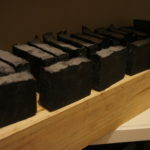 After 6 weeks of curing this wonderful soap it is finally ready to use! Scented with refreshing Tea Tree and Peppermint Essential oils. This bar of soap is amazing even for the most sensitive of skin types. Activated charcoal makes this bar unique. It’s effective at treating body odor and acne and relieving discomfort from insect bites & rashes from poison ivy. We hand-craft our cold process soaps with healthy high quality ingredients that are enriching to your skin. This soap bar contains virgin olive oil, unrefined coconut oil, unrefined shea butter, grapeseed oil, sweet almond oil and Aloe Vera. Aloe Vera is AMAZING for your skin! It gives quite a large vitamin and mineral boost. Aloe vera contains a huge amount of vitamins including vitamin A, B1, B2, B3, B6, C, and E. It’s also rich in choline and folic acid, all of which help the skin regenerate and stay healthy. The minerals in aloe vera are abundant as well, with calcium, iron, potassium, copper, manganese, selenium, sodium, chromium, and many more. What you will NEVER find in any of our soaps: parabens, sulfates, petroleum products, silicones, phthalates, synthetic surfactants, artifical colors or synthetic fragrances. 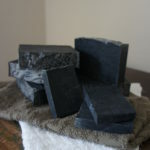 We have created a hand-crafted soap line the whole family can use. From baby to grandma, and everyone in between! Click here to see more soaps. Share with us your favorite soap scents!